Vibrant jeweltone colors stride onto a black base. These colors will blend gracefully with your companion's dress. Look sharp in backless or full back vest. Wear with matching tux tie or black colonel tie, or bolo for a Western flair. 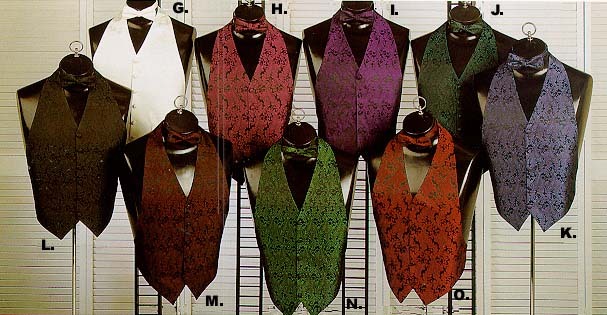 Or, use the cummerbund and matching tux tie for that "expected" appeal. A traditional paisley brocade is finely stitched to black cloth liner. Backless vest is adjustable at collar for length and has adjustable elastic waist straps in rear. Full back vest has black back matching liner material.